Why this galaxy stopped forming stars is still unknown, researchers said. Washington: Astronomers have detected a first-of-its kind compact yet massive, fast-spinning, disk-shaped galaxy that stopped making stars only a few billion years after the Big Bang. The finding, published in the the journal Nature, was possible with the capability of NASA's Hubble space telescope. This was the first direct observational evidence that at least some of the earliest so-called "dead" galaxies -- where star formation stopped -- somehow evolve from a Milky Way-shaped disk into the giant elliptical galaxies we see today. "This new insight may force us to rethink the whole cosmological context of how galaxies burn out early on and evolve into local elliptical-shaped galaxies," said study leader Sune Toft from University of Copenhagen, Denmark. "Perhaps we have been blind to the fact that early 'dead' galaxies could in fact be disks, simply because we haven't been able to resolve them," Toft said. 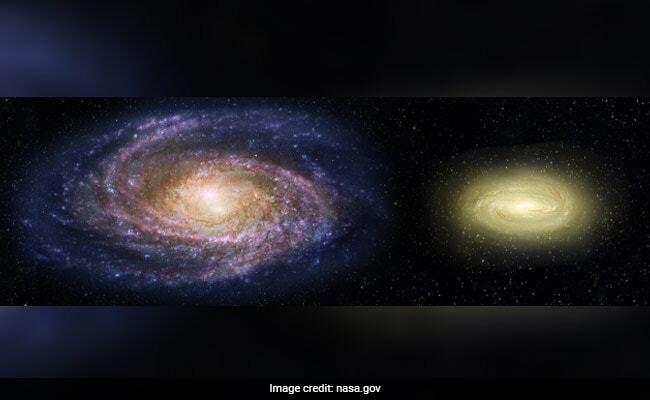 Rotational velocity measurements made with the European Southern Observatory's Very Large Telescope (VLT) showed that the disk galaxy was spinning more than twice as fast as the Milky Way. This energy inhibits star formation by heating the gas or expelling it from the galaxy. Or it might be the result of the cold gas streaming onto the galaxy being rapidly compressed and heated up, preventing it from cooling down into star-forming clouds in the galaxy's centre. "Probably through mergers," Toft said.